Can you avoid carpal tunnel syndrome? Physical therapy, splinting, and corticosteroid injections may relieve symptoms temporarily. You may suspect that you have carpal tunnel syndrome (CTS) if you experience numbness, tingling, and weakness in your hand. CTS is a common condition that doesn't go away on its own. "The longer you wait to get help, the less likely you will respond completely to treatment, if the process has progressed beyond a certain point," says Dr. Chaitanya Mudgal, a Harvard Medical School assistant professor. The median nerve and nine tendons in your forearm enter your hand through a small area known as the carpal tunnel. It sits beneath a ligament that runs across the bottom of your palm. Sometimes the tissue around the tendons can swell and press on the median nerve, resulting in tingling and numbness in the thumb and most fingers. Symptoms often wake people at night. "Patients have difficulty staying asleep because their hand goes numb. Or numbness starts when they're talking on a phone, or reading a newspaper," says Dr. Mudgal. The cause of CTS is unknown. It is more common in people with diabetes, rheumatoid arthritis, gout, and wrist fractures. The condition is most often linked with aging. Dr. Mudgal is skeptical of the common idea that CTS is caused by activity, especially using a computer keyboard. "There is not one shred of evidence that carpal tunnel syndrome is caused by keyboard use," he says. Diagnosing CTS requires tests that measure the electrical activity of the median nerve, and detect whether the activity is slowed due to increased pressure in the carpal tunnel. "But in the early stages of the condition, it may not have progressed enough to be picked up, so the study may be negative," says Dr. Mudgal. Wearing a brace at night to keep the wrist straight may help reduce swelling in the carpal tunnel. Splinting. Wearing a brace or splint that keeps the wrist straight may help to reduce the swelling of the tendons in the carpal tunnel and keep pressure off the median nerve. It's especially helpful at night, when CTS effects are at their worst. You can find a brace in a drugstore, or your doctor may prescribe one for you. Exercises and stretches. A physical or occupational therapist can guide you through stretching and nerve gliding exercises for your wrist and hand. "There are very few studies that suggest motion exercises might help, but they're not fully proven, and their role remains unclear," says Dr. Mudgal. Injections. An injection of a corticosteroid into the carpal tunnel may help relieve symptoms of CTS. "Some people strongly believe in the injections," says Dr. Mudgal. "If the electrical study shows a mild problem, one study has shown that such injections are beneficial. However, in more than 80% of people with the benefit, symptoms recur within one year." He cautions that approaching the nerve with a needle carries a risk of pain and injury, especially if the steroid is accidentally injected into the nerve. Other options. You may also hear about using acupuncture or vitamin B6 to relieve symptoms. There aren't much data to support either, but Dr. Mudgal says it won't hurt to try. "And people still talk about work station modification, so you don't bend the wrist too far up or down, but that's never been shown to make any difference in the progression of carpal tunnel," he says. This move may decrease pressure in the carpal tunnel. 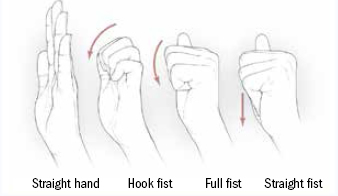 Make a full fist; return to a straight hand. Make a straight fist; return to a straight hand. For people with more severe symptoms or for those whose symptoms don't respond well to nonsurgical treatments, the only effective treatment, says Dr. Mudgal, is surgery. "It's a good procedure with a high rate of success," he says. The surgeon relieves pressure on the nerve by cutting the transverse carpal ligament. Most patients do not need physical therapy after surgery. Ask the doctor: What causes tingling hands at night?